The opposition ‘fury-forgiveness’ might be where we should begin. In his short text on Forgiveness, Jacques Derrida makes a comment on the necessity of forgiving the unforgiveable if forgiveness is to mean anything at all. He writes (Derrida 2001, p. 32), ‘Forgiveness is not, it should not be, normal, normative, normalising. It should remain exceptional and extraordinary, in the face of the impossible: as if it interrupted the ordinary course of historical temporability.’ Forgiveness demands something exceptional if it is to be real. Perhaps this is something that is already widely known – that just saying, for example, ‘I forgive you’ could be no more than an empty phrase (like ‘We come in peace’ in the film Mars Attacks) or worse than that, an aggressive attack in its own right, sanctimoniously derogating the one who has done wrong and ensuring that there is no way they can reclaim the moral high ground, but instead narcissistically grabbing it for oneself. ‘Whatever you have done to me is of no account, because I have the power to forgive.’ But Derrida has something more in mind than this. He thinks that forgiveness only makes sense in relation to something that has been done that cannot be forgiven easily; that is, a struggle has to take place to lift this experience out of the ordinary and into being an encounter that is truly, even religiously, other. 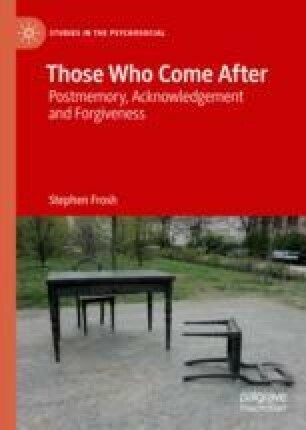 This claim, that forgiveness only means something when it is not logical, when it stands outside what Derrida (p. 39) calls ‘the ordinary course of history, politics, and law, ’ is especially to the point when egregious crimes are considered – crimes which in many respects seem, exactly, unforgiveable. Donoso, G. (2018). Researching Trauma in Relation to Gross Human Rights Violations: A Psychoanalytic and Reflexive Account. Qualitative Research in Psychology. https://doi.org/10.1080/14780887.2018.1472356.